Do You Have “Ticks & Fleas”? I have had many mentors throughout my life and career, but I think there are three who influenced me the most as a medical professional. One was my undergrad Anatomy & Physiology professor, Dr. Lee. Dr. Lee had a very enthusiastic way of teaching what can be extremely dry and boring material. He was the master of analogies and storytelling. He could describe a physiological process in such a way that it made learning about the Kreb’s cycle (the metabolic cycle of a cell) fun, and, most importantly, memorable. Then, there was my graduate school Gross Anatomy professor, Dr. Bakkum. This man was funny! Back then (1991), I thought he could have made his living as a stand-up comic. He was every bit as imaginative as Dr. Lee and then some. He told jokes as a way of getting us to remember the order and function of anatomical structures. He would run around the front of the lecture hall gesturing and waving his arms and acting out to demonstrate muscular connections and function. Finally, there was the “ticks & fleas” clinician, Dr. Poierier. Dr. Poierier was my Clinical Cardiology, as well as Physical Diagnosis professor. He was also one of the head clinicians in our student clinic, a place where we student doctors could test our skills on other students. What he meant was that my patients have a whole life history of physical events before they ever show up in my consultation room with their chief complaint of lower back pain (or headaches or neck pain or arm numbness). They have had accidents, injuries and illnesses that have had influence on not only their health, but their spinal structure over the years. Maybe they were a paratrooper or a RECON Marine who jumped out of planes for 4 or more years and they have old compression fractures of their spine and degenerative discs. Maybe they drove a semi around the state, loading and unloading their truck and now they have a curve in their spine and chronically tight muscles from always twisting the same way for the past 20 years. Maybe they have a job where they sit at a desk all day. Or perhaps they were an athlete through high school and college and that has initiated some degenerative changes in their spine. When these patients come in to tell me about their recent (or chronic) complaint of lower back pain, what is really going on with them might be more than just a spinal subluxations causing their problem. In fact, the subluxations may just be the tip of the “ice berg”. I saw a patient a couple of weeks ago who came in complaining of lower back pain and severe spasm. She said it had been going on for just 3 days and started after riding in the car while traveling to Florida from the northern states. She described what positions and activities caused her more pain and which activities do not. I asked her many prompting questions and she did her best to answer them. After about 10 minutes, I had a pretty good idea what I would find during her examination: severe muscle spasm and SI Syndrome. Indeed she had SI syndrome! 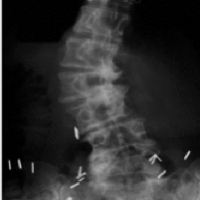 The loss of motion of her sacroiliac joint on the right side which caused increase motion of her sacroiliac joint, pain and spasm on her left side – this was her “tick”. This was easily confirmed with a thorough examination using hands on orthopedic and neurological tests. But as the examination continued, and as I continued to ask her questions, I learned that she also likely had “fleas”. When I examined her spine, I noted a curvature and told her what I saw and felt. She told me then that she remembered her doctor many, many years ago telling her she might have scoliosis. She also stated that her mother had severed scoliosis and spinal arthritis. She remarked that she hoped she didn’t get that from her mother because her mother was always in significant pain. Her x-rays showed spinal subluxations for sure throughout her spine, as well as the scoliosis in her lumbar spine along with disc degeneration and spinal and sacroiliac arthritis. Her lumbar vertebrae were twisted as far as they could to one side, putting (I’m sure) considerable pressure on her lumbar nerve roots. But the scoliosis, ironically, didn’t distort her overall posture too much, so, just looking at her with an untrained eye, one would have never suspected she had scoliosis to this degree. Now, this nice lady just wants to be rid of the back pain, which is also my treatment goal for her. I somehow needed to explain to her that the problem she is having today didn’t really start just 3 days ago. Because of the scoliosis and arthritis, it is going to take more than a couple of adjustments to (1) make her feel better (2) improve the mobility of her spinal and pelvic joints and (3) have enough impact on her structure to prevent the pain from coming back the moment she rides in her car for more than 30 minutes…or unloads groceries from her car, or picks up one of her grandchildren. So, as I reviewed her x-rays and exam findings with her, I told her, “You have ticks & fleas” and proceeded to explain how the spinal problems viewed on her x-rays have been ongoing, likely most of her life, and this particular issue of left sided sacroiliac pain is just the icing (and newest issue) on this layer cake of spinal problems. 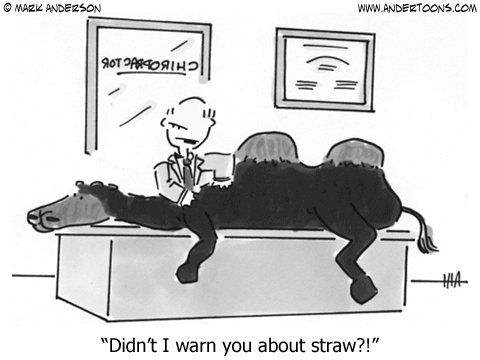 I explained how untreated subluxations and scoliosis actually cause arthritis and disc degeneration, and that long car ride that seemed to cause all this pain was just the trigger or just the straw that broke the camel’s back. I didn’t tell her this to scare her, I just want her to temper her expectations and realize there isn’t really a quick and easy fix for what is going on with her. She’s now had just 4 treatments and she is already feeling and getting around better – even her posture has improved a bit. I have no doubt that she can go on to live a pain free existence, but it is going to likely take on-going supportive care that includes chiropractic adjustments to her spine and pelvis, and daily stretching and balancing exercises that she can do at home. As I explained what she would need to do long term (if she chooses), she then admitted to me that she had bouts of back pain throughout her life. Chiropractic adjustments always seemed to help resolve her pain (which is why she called me), but none of her doctors (MDs or DCs) had ever taken an x-ray of her spine and she never knew her back was this bad. When she did go to a chiropractor she never got treated more than a couple of times (just long enough for the pain to go away) and then she would quit care because she figured the problem was resolved. She admitted that after the 10th bout of back pain in the same area of her spine, she suspected there was more going on than a muscle spasm. No one had ever taken the time to explain that the muscle spasm was the “tick” and the real cause of the problem were the fleas she never knew she had: subluxations, scoliosis and resulting arthritis and disc degeneration. This lady loves to exercise and knows the importance of a healthy balanced spine. Perhaps if one of her doctors, during one of her episodes years ago, had explained to her that she had “ticks & fleas” she would have done more to correct and support her spinal health. ⟵Does Chiropractic Care Heal Disease?